This six-session video-based, small group Bible study from Rick Warren, Dr Daniel Amen and Dr Mark Hyman is an innovative approach to achieving a healthy lifestyle that is both transformational and sustainable because it is about abundant choices, not diet deprivation. With assistance from medical and fitness experts, Pastor Rick Warren and thousands of people from his congregation started on a journey to transform their own lives. It started with God?s prescription for their health, and it?s called The Daniel Plan. 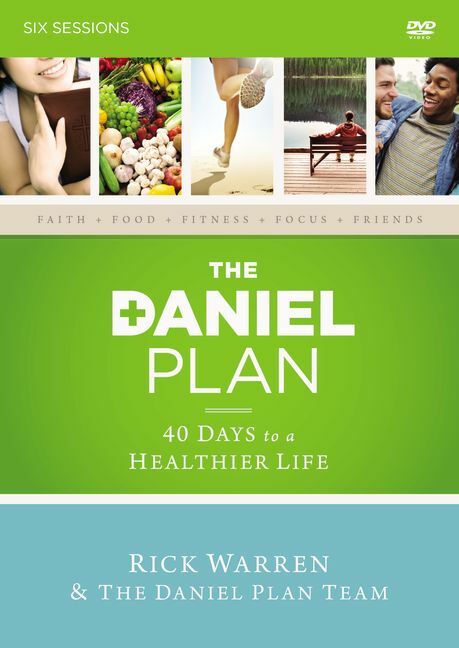 The Daniel Plan small group Bible study teaches simple ways to incorporate healthy choices into your current lifestyle. The study is centred on five essentials that will guarantee your success: faith, food, fitness, focus and friends. Each area affects the others and can?t succeed solo. So are you ready to revolutionise your health once and for all? The Daniel Plan small group study gives individuals, small groups and whole congregations the encouragement and accountability needed to succeed in living a healthier lifestyle. The Daniel Plan DVD by Daniel G. Amen; Mark Hyman; Rick Warren was published by Zondervan in December 2013 and is our 6569th best seller. The ISBN for The Daniel Plan DVD is 9780310824459. Be the first to review The Daniel Plan DVD! Got a question? No problem! Just click here to ask us about The Daniel Plan DVD.